Bucolic scenery, verdant fields, pleasant weather. It would be the perfect setting for sipping on a coffee and relaxing on a farm in the Paraíba valley of Rio de Janeiro state in southern Brazil, if there had not been so much blood spilled here. The region, e fields, pleasant weather. It would be the perfect setting for sipping on a coffee and relaxing on a farm in the Paraíba valley of Rio de Janeiro state in southern Brazil, if there had not been so much blood spilled here. The region, enriched by the exploitation of slave labor on coffee plantations, was also known for the particular brutality with which slaves were treated. Those days have passed but the region’s economy has gained a second wind: it now appears on the state’s cultural map*, advertising a form of tourism that glorifies its past while naturalizing racism and slavery. 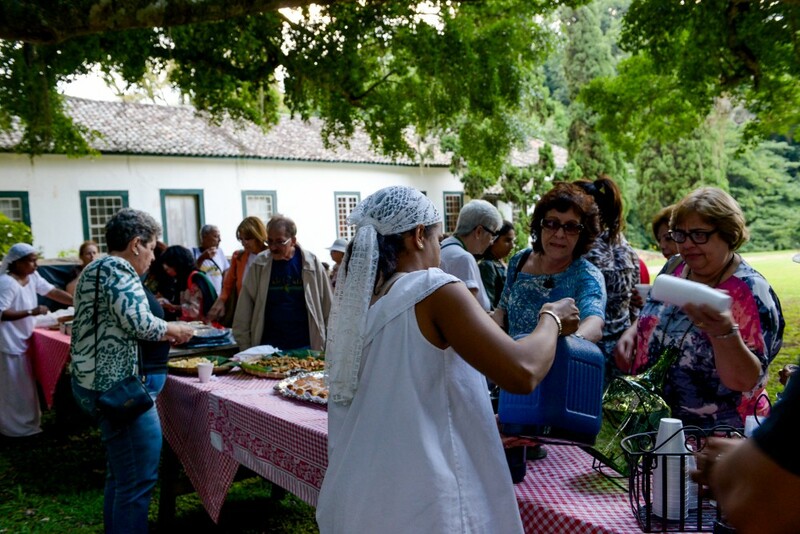 If, in the year 2016, you would like to be served by a black person dressed as a slave, you can visit, for example, the Santa Eufrásia Plantation in Vassouras. 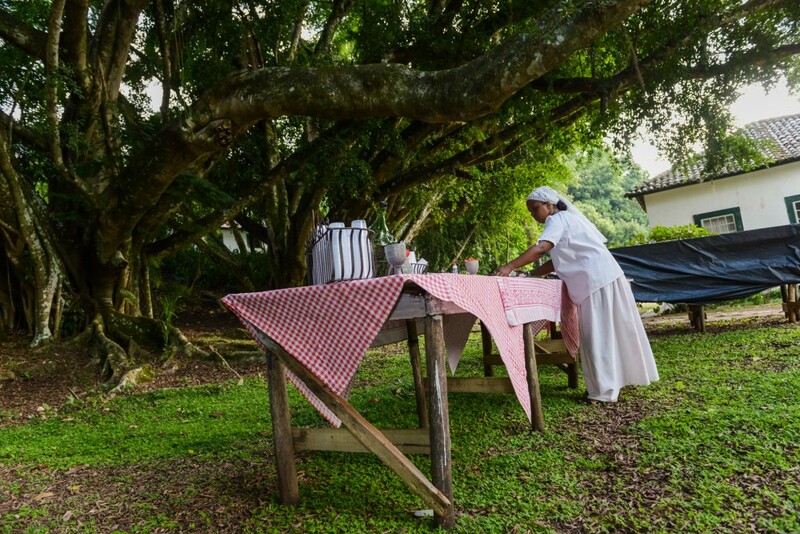 Constructed around 1830 and located in the Vale do Café, or Coffee Valley, it is the only private plantation protected by Rio de Janeiro’s Institute of National Historic and Artistic Patrimony (Iphan-RJ). The property passed through the hands of multiple owners until 1895 — seven years after the abolition of slavery — when it was purchased by Colonel Horácio José de Lemos, whose descendants still own the property today. Their plans to restore the plantation were approved in 2013 and it now receives daily, pre-scheduled tourist visits. The region’s particularly savage treatment of enslaved black people entered the historical record in 1829 when Eleutério Delfim da Silva, a government official in Vila da Valença (now known as Valença), the town next to Vassouras, expressed worry about the “brutal punishments that the slaves of that Vila received.” He even testified to the city council at the time exposing the cruelty. But this does not seem to be a relevant issue to those who exploit the region’s touristic potential. Would the people who spend a relaxing afternoon in these slave quarters and plantation houses have the courage to hop on a Polish boxcar train headed to Auschwitz and share their seats with smiling Jewish actors dressed up as their ill-fated ancestors? When tourists go to visit places like the Holocaust Museum in Berlin — or even the one in Curitiba, Brazil — they are moved by the pain suffered by the Jewish people who were enslaved and massacred by the Nazis. They cry, become ill, and express their outrage on social media. However, tourists are shielded from the horrors of slavery when they visit a plantation like this one, where they listen to an intimate concert, are served by people dressed as slaves and guided by the plantation’s mistresses on a “walk back in time,” without any critical perspective. Brazilian governments at all levels have opted systematically to bury this part of history, despite being the last country in the Western world to abolish slavery. The future is prioritized to detriment of the past. We saw this happen in the heart of Rio de Janeiro with the construction of the generic Museum of Tomorrow, built on top of the arrival point for the largest number of enslaved black people in human history. “I usually have a house slave, but she ran away. She went into the woods. I sent the slave catcher after her, but she didn’t come back. … When I want to grab a dress, I say: ‘two slaves, please!’ because no one can reach all the way up there by themselves.” It sounds like 1880, but, as you can see in this video, the phrase was uttered by Elizabeth Dolson, one of the great-granddaughters of Col. Lemos and the owner of the Santa Eufrásia Plantation. She receives tourists on her land and introduces herself as if she were a plantation mistress during the slavery era. She leads the tours dressed in period clothes, accompanied by black women dressed as slaves in all white, serving those who are inclined to pay between 45 and 65 reals ($15-$20) for the service. Racism? Because of what? Because I dress as a plantation mistress and I have a house slave who dresses as a house slave? What are you talking about?! No! I don’t do anything racist here! What is the problem with having … no! Rio-based historian Luiz Antônio Simas believes that Brazil’s education system contributes to the cultural myopia. “Brazilian schools reproduce discriminatory values and are radical enemies to the progress that is necessary. It’s not enough to adopt affirmative action quotas for black and native people if the school environment continues to reproduce a vision of the world as white, Christian, European and founded on preconceived notions of civilization that negate ancestral ways of knowing and the inventions of the Afro/Native American world,” he said in an interview with The Intercept. In the year of Brazil’s first national census, 1872, 5,820 of Vassouras’ 10,000 residents were enslaved — almost 60 percent of the men and 56.4 percent of the women. The neighboring town of Valença, home to Rio de Janeiro state’s largest “quilombo” (a settlement founded by escaped former slaves), has a similar population breakdown. In 1873, there were 27,000 slaves in Valença, a number that represented more than 70 percent of the population at the time. Today, almost half of Valença’s population is black, but the proportion of white people that earn at least five times the minimum wage is 29 times greater than that of their black and brown neighbors (the two categories in Brazil’s census that the government considers Afro-Brazilians). On the other hand, black residents earn two times the minimum wage or less at a rate double that of their white neighbors. In other words, black people in Valença — much like in the rest of the country — worked hard and literally gave their blood but were unable to move up the social pyramid. The owners of the plantations, meanwhile, who were already not paying for labor — are compensated when their lands are recognized by the government as official Quilombo settlements, where enslaved people and their descendants took refuge and resisted slavery. This is the case of the São José da Serra Quilombo in Valença. “Today is a very important day, because today we will have a victory, a victory that we have been working towards for a long time.” Tio Mané spoke these words in April of 2015. “I was born and raised here. I am 95 years old, but I was born right here.” Tio Mané was born free, 12 years after abolition, on the land where his mother was enslaved and where he has raised his sons, grandsons and great-grandsons. Approximately 200 people live on the quilombo. They are the seventh generation to live there since the first enslaved Africans were brought to work in the coffee fields on the plantation with the same name, São José. 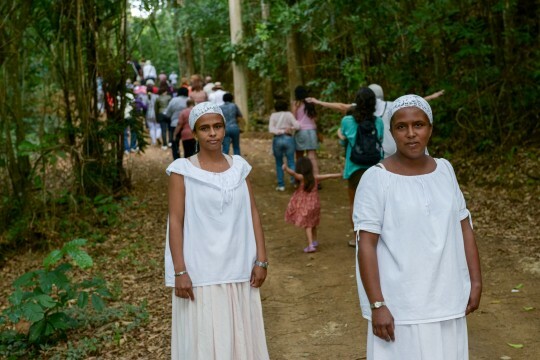 Just over a year ago, the 393-acre parcel of land was officially recognized as a quilombo due to its role in Afro-Brazilian history. The previous white landowners received 569,000 reals (approximately $166,00) in reparations for the expropriation. This means that enslaved people produced a double return: They were forced to work for years and now the lands where they were exploited yield reparations for the landowners. But that is not really what happened. Brazil implemented public policies to incentivize white foreigners to come to the country, with the explicit intention of whitening the population. The blackness of the nation’s population was seen as a problem to be confronted. Early during Brazil’s First Republic (1889-1930), decree #528 (June 28, 1890) determined that people from Asia and Africa required special congressional authorization to enter the country. The efforts to lighten the population were reiterated over the years. Through subsidized immigration, entire white families had their tickets paid for by the government to immigrate from Europe. The landowners’ surplus wealth also covered the new arrivals’ living costs during their first year in the country. Beyond this, the settlers received a fixed annual salary and another salary proportional to the volume of their harvest, with a price fixed per bushel of coffee produced. In other words, it wasn’t just good old fashioned hard work that put them on their feet in the New World. With the influx of immigrants, lawmakers saw the chance for a whiter Brazil. Congressmen turned that hope into law by adding a passage to the 1934 Constitution that explicitly advocated eugenics, a racist, pseudo-scientific theory en vogue at the time that envisioned the path to a “perfect,” “well-born” human race. The same Constitution that first established the right to free primary school education in every Brazilian state also advocated “stimulation of eugenics education.” The government promoted the “perfection of the human species,” by means of mixing the “biologically well-endowed” while simultaneously developing educational programs to promote the conscious reproduction of “healthy couples” — a core tenet of Nazism. The same article of the Constitution stipulated limited educational access for “mulatos,” “blacks” and “deficients” (of all levels) and that social, philanthropic and educational initiatives were merely palliatives and would not resolve the problem of race. Currently, Brazil’s criminal code includes a statute for the crime of “racism” as well as a separate offense of “racial insult,” which carries milder penalties and is more commonly applied. The law’s euphemistic treatment of racism is just one of many examples of how Brazil continues to deny the existence of racism. As the Brazilian abolitionist and statesman Joaquim Nabuco so appropriately said: “Ending slavery is not enough. We have to do away with what it built.” We have hardly gotten past the former and remain a long way from ending the latter.